Tailored to the true luxury drop-top fan, the Mercedes-Benz SLK-Class returns for 2016 with a few changes to its base trim. The 2-seat compact hardtop convertible roadster offers a choice of 3 engines and 2 transmissions, along with some handsome styling and a healthy dose of standard perks. It is only available in its traditional rear-wheel-drive (RWD) configuration, contains a surprisingly spacious (for a convertible) 10.1 cubic feet of trunk space, and offers a power-retractable roof. For 2016, the base SLK250 has been re-branded the SLK300 and boasts a new powerplant, not to mention a new automatic transmission that replaces both the traditional manual transmission and the now-defunct 7-speed automatic. The two returning trims include the up-featured SLK350 and the V8-equipped SLK55 AMG. Additional changes for the 2016 SLK-Class include a couple of new exterior colors and available blind-spot monitoring as a standalone option (or as part of the Driver Assistance package). Expect the 2016 SLK300 to be outfitted with 17-inch alloy wheels with performance tires, a fixed glass sunroof, leatherette upholstery, power-adjustable front seats, full power accessories, cruise control, and telescoping tilt-wheel steering. Standard technology includes a remote garage door opener, manual air conditioning, mbrace 2 infotainment with a 5.8-inch touchscreen, memory for driver settings, and a 4.5-inch driver information display. Bluetooth hands-free calling is scheduled to remain standard, as is a CD/MP3 player with 8 speakers and an auxiliary audio input. 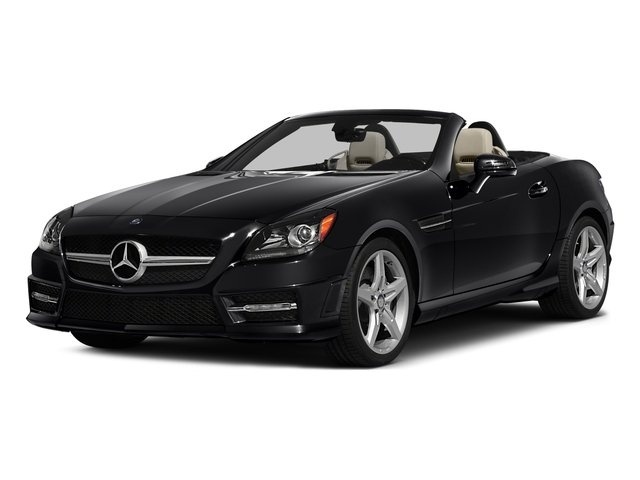 The SLK350 adds 18-inch alloy wheels, leather upholstery, heated front seats, and a 500-watt Harman Kardon audio system with 11 Surround Sound speakers and satellite radio. If you decide on the SLK AMG55, you'll also get premium leather upholstery, sport front seats, a sport-tuned suspension and steering rack, a sport exhaust system, torque-vector cornering, and added interior lighting. Options include upgraded alloy wheels, an auto-tinting sunroof (Mercedes' Magic Sky Control), COMAND-interfaced GPS navigation, Airguide wind-blocking for less top-down buffeting, unique Airscarf neck-warming headrests, and available carbon-fiber cabin accents in the AMG55. Power-wise for 2016, the base SLK300 gets a new 2.0-liter turbocharged inline 4-cylinder (I4) engine that uses a new 9-speed shiftable automatic transmission to manage 241 hp and 273 lb-ft of torque. This force-fed I4 is also equipped with engine stop/start technology for some added fuel efficiency, as well as the variable-effort Direct-Steer System. Look for an EPA-estimated 25 mpg city/32 highway/28 combined out of a tank of premium unleaded. 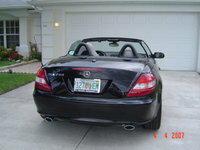 The SLK350 keeps its 3.5-liter non-turbocharged V6 powerplant and standard 7-speed shiftable automatic. Expect this hefty V6 to deliver 302 hp, 273 lb-ft of torque, and mileage of 21/29/24 when burning premium unleaded. The SLK AMG55 sports a 5.5-liter non-turbo V8 mill that again mates with an AMG-tuned 7-speed shiftable automatic for 416 hp and 398 lb-ft of torque. Expect mileage estimates for the V8 to return at 19/28/22, and keep in mind that it only uses premium gasoline. Safety features slated to return aboard all 2-seat SLK-Class convertibles include 4-wheel antilock brakes (ABS), traction and stability control, side-mounted head curtain airbags, LED daytime running lights, turn-signal-integrated mirrors, mbrace emergency telematics, a post-collision safety system, and a remote antitheft alarm. Optional safety equipment includes the popular Parktronic system with front and rear parking sensors, as well as the Driver Assistance package with adaptive cruise control, blind-spot monitoring, lane-keeping assistance, and pre-collision braking. Be advised that, for whatever reason, neither the government nor the insurance industry have recent crash test data on the Mercedes SLK-Class. Often described by owners as impractical but a heck of a lot of fun, the SLK-Class is now on sale for 2016, competing with BMW’s similarly equipped and priced Z4, Porsche’s Boxer, Audi’s all-wheel-drive-eligible TT Roadster, and Chevy’s legendary Corvette Convertible. What's your take on the 2016 Mercedes-Benz SLK-Class? Users ranked 2016 Mercedes-Benz SLK-Class against other cars which they drove/owned. Each ranking was based on 9 categories. Here is the summary of top rankings. Have you driven a 2016 Mercedes-Benz SLK-Class? Will CARVANA Accept Trade-ins Towards Purchases? I have a 2014 Scion FR-s. 19300 miles, excellent condition. Bought as CPO with transferable warranty until 2021. 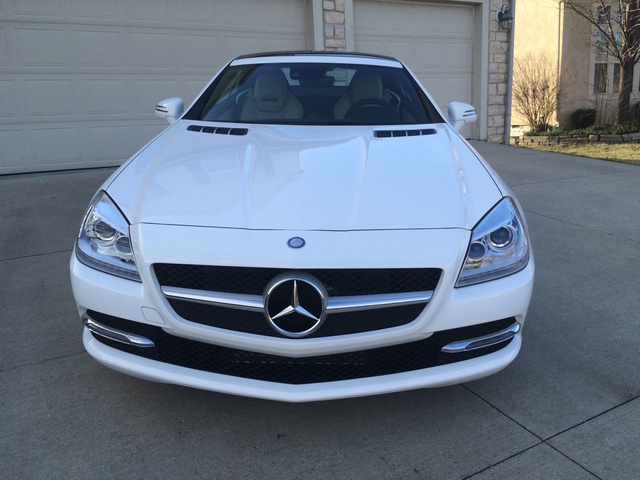 Would like to trade this car in towards target vehicle, 2016 Mercedes SLK 300.